Spinal Cord Injury Awareness Month Video montage brought to you by PhotoAbility Disability Inclusive Stock Image Library. PhotoAbility is working with real models with disabilities, versus able bodied models posing in fake wheelchairs, and photographers worldwide to create positive and authentic stock images that change perceptions and stigma. They hope to increase the usage of these type of images in media, advertising and publications. When companies, designers and agencies buy these inclusive images for websites, marketing or design needs, they are also supporting this work and the models and photographers behind it. 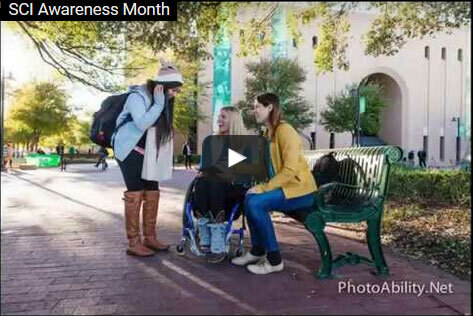 Bring awareness to the faces of Spinal Cord Injury by supporting this effort and sharing this video widely to help create a more inclusive world. Every 48 minutes someone in the U.S. is paralyzed from a spinal cord injury. There are approximately 1, 200,000 people living with spinal cord injuries (SCI) in the United States according to the Reeve Foundation. A majority of injuries occur from motor vehicle accidents, falls, work-related accidents, and sports injuries. Also, please consider making a donation to support United Spinal’s mission. Make a donation in honor of a loved one, caregiver, scientist or organization who is working to improve the life of those injured to the Miami Project/Bouniconti Fund to cure Paralysis. Hey Buddy!, I found this information for you: "Spinal Cord Awareness Month Video: What is our Scene?". Here is the website link: https://pushliving.com/spinal-cord-awareness-month-video-what-is-our-scene/. Thank you.